For the past six weeks or so, I’ve been binge-watching The Good Wife, which I’d initially abandoned fairly early in season one. That sort of concentrated immersion in a legal drama can’t help but serve as a primer on methods of argumentation. Over the course of 115 episodes (so far), I’ve seen the attorneys on both sides use just about every trick in the book, and then improvise additional books of their own. Perhaps the only device that doesn’t frequently get employed is reductio ad absurdum, in which a proposition’s truth or falsity is suggested by taking the idea at its core to a deliberately ridiculous extreme. Makes sense, really—it’d be hard to even get started without hearing an immediate objection on the grounds of relevance, and the jury would surely be instructed to disregard any such story even if one survived intact. Movies, however, are not jury trials, and reductio ad absurdum can be a powerful tool. One of the best examples I know of occurs early in Elia Kazan’s superb melodrama Wild River, which was released in 1960 but concerns the actions of the Tennessee Valley Authority during the 1930s. Montgomery Clift plays Chuck Glover, a TVA employee who’s been sent to persuade a stubborn old woman, Ella Garth (Jo Van Fleet), to sell her property on an island that’s soon to be flooded by the construction of a dam. Mrs. Garth is the island’s sole remaining holdout, apart from the black laborers who work for her family, most of whom have stayed put out of a combination of loyalty and fear. And the movie respects and admires her principled refusal to submit to the dictates of eminent domain (a term never spoken by any character, oddly enough, though it’s the crux of the government’s position), even as it recognizes that the dams built by the TVA were necessary and beneficial for the population as a whole. Chuck tends to make his case using abstract promises about people’s future happiness and well-being. Mrs. Garth, on the other hand… well, take a look at this clip, and see just how effective her use of reductio ad absurdum is. 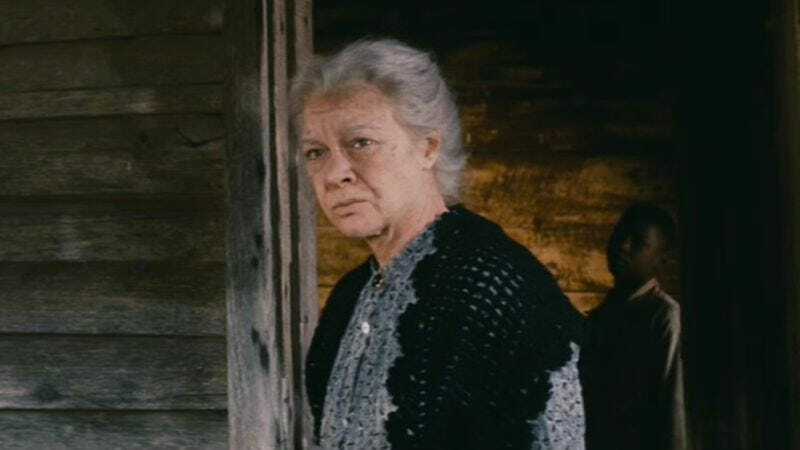 First things first: Jo Van Fleet was only 45 years old when she appeared in Wild River. She was actually 16 years younger than Jay C. Flippen, who plays her character’s son, Hamilton Garth. Apparently, makeup was involved, but it’s not the garishly unconvincing old-age makeup that was standard during Hollywood’s golden age. They merely whitened Van Fleet’s hair, added some unobtrusive wrinkles and liver spots, and let her performance do all the heavy lifting. She was somehow capable of seeming—not just looking, but genuinely seeming—much older than her years, right from her big-screen debut as James Dean’s mom in East Of Eden. That role scored her an Oscar nomination; this one, surprisingly, didn’t, even in a year so weak for Best Supporting Actress that Shirley Jones managed to win (for Elmer Gantry). To be clear, what’s impressive isn’t that Van Fleet is playing a character almost twice as old as she is—it’s that she’s not letting the need to appear elderly distract her from the character’s emotional truth. There’s nothing even remotely stunt-like about her work here. It’s direct and unfussy and powerfully moving. That said, she gets an invaluable assist from Wild River’s remarkably complex screenplay, written by Paul Osborn (who also adapted East Of Eden). One of the reasons this scene works so well is that Osborn begins it by having Mrs. Garth more or less threaten the black workers, in response to the sudden departure without notice of one worker who decided he didn’t want to stay and drown. An earlier scene had made it clear that the Garth family itself does no real work on the island, and there’s a civil-rights aspect to the story, as Chuck gets angry pushback from white thugs when he announces his intention of hiring African-Americans to clear the island (once Mrs. Garth agrees to leave or is forcibly removed), and of paying them the same wage as white laborers. Consequently, when Mrs. Garth commences her speech, intimidating a bunch of silent, wary black men who inhabit what looks like a shanty town, she comes across as the movie’s villain. She even bangs on the door of the abandoned shack with her cane at one point, implying that anyone else who leaves the island without informing her will suffer physical violence.